Respiratory problems affect the health and performance of one in six horses. Horses that are stabled, even part time, are even more likely to suffer from some degree of inflammation of the airways, even if they are asymptomatic. So, what's a horse lover to do? Some gains can be made by clearing the air, of course. Make sure the stable is well-ventilated, use dust free bedding, and steam hay with Haygain. Other forage steamers and soakers control spores by dampening them, but Haygain thoroughly kills all spores, so your horses can munch on dust and spore-free hay. The patented technology utilized by Haygain, whose principals have years of experience working with Jiffy Steamers, was developed and tested at the Royal Agricultural College in Cirencester, Great Britain. 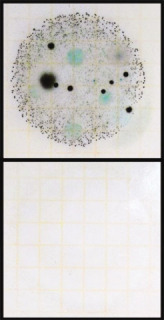 The petri dish films to the right show the results: the top petri contains 7.75 million spores on a single gram of untreated good-quality hay. The lower petri shows none. Hard to believe, but the Haygain steamer actually produces dust and spore free hay after only 30 minutes in the steamer. And the results are the same whether you use high-quality hay or not. The Haygain steamer holds one bale of hay, so you can just take one off your load and put it in the steamer with the required amount of regular tap water. The first time you use the steamer, it will take 50 minutes to sterilize the hay; after that, only 30 minutes. It's great to serve your horse warm clean hay soon after it's steamed, but anytime up to 24 hours after will do fine. You will be guarding the respiratory health of your horse, helping to prevent chronic obstructive pulmonary disease and inflammatory airway disease caused by dust and toxin-producing bacteria present in forage. In addition, you'll be removing any molds which may cause digestive problems and may alter the nutritional value of the hay. Not only does the Haygain benefit your horse, but you might see significant improvement in your own respiration! Read the full report at Haygain.